Thirty percent of all dogs and 60 percent of stray and abandoned dogs that are received by the Mohawk Hudson Humane Society in Menands, N.Y., are pit bulls or pit bull mixes. In 2010, the society participated in the ASPCA’s Save More Lives $100K Challenge, ending the competition in the top 10 out of 50 shelters that participated in the country. During the challenge, the society tried a host of new adoption promotions to continue boosting our lifesaving goal. Toward the end of the three-month challenge, society staff asked if we could hold an event specifically targeting pit bull adoptions. 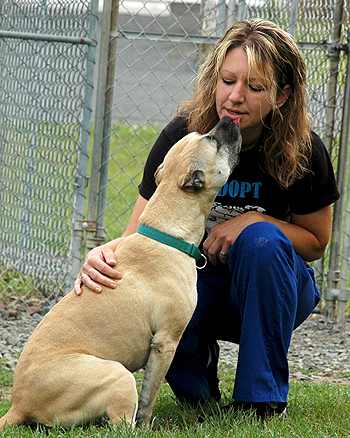 Pit bulls stay at the shelter twice as long as other breeds of dogs because of their reputation, so they tend to be the dogs to which the staff and volunteers become most attached. 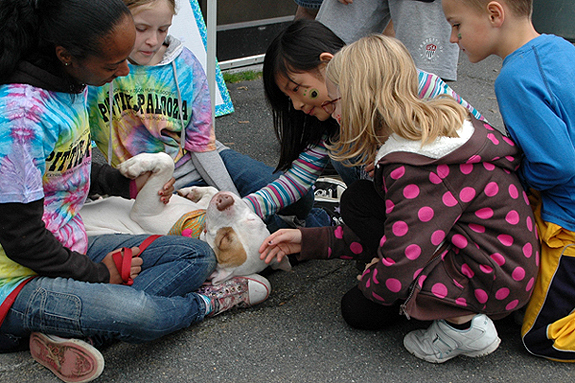 The result was the first annual Pittie-Palooza adoption and education day. During a four-day period, the society focused on promoting the adoption of pit bull type dogs, educating the public about what great dogs they are and offering advice to current pit bull guardians. Sixteen pit bulls were adopted during those four days. Volunteers who participated felt that we should be promoting this misunderstood and maligned type of dog all year long and soon formed Save-A-Bull. The volunteers and staff involved in Save-A-Bull immediately started planning events to promote pit bull adoption, education and understanding. We created a spay/neuter program for pit bulls and started offering vaccine clinics in neighborhoods where many of the shelter’s pit bulls were coming from. When people came out to get their dogs vaccinated, Save-A-Bull members were there to schedule their dogs for spay or neuter surgery. Every program needs funding to be successful, and while the group was successful at raising funds, they wanted to have a larger impact and applied for a Pepsi Challenge grant. Save-A-Bull was accepted as a participant in the Pepsi Challenge program in July of 2011, and voters from across the country rallied to help pit bulls, securing $25,000 for the Save-A-Bull program. Most of the funding is going toward free training classes for pit bull companions. We feel that by making sure that the pit bulls in the community are well trained, we will change the public’s perception of the breed. The grant will also pay for pit bulls to receive their Canine Good Citizen (CGC) and Therapy Dogs International testing. We have already had four successful CGC candidates. Additional funds went to make pit bulls more comfortable in the shelter while they await adoption and to host two off-site adoption clinics every month. Save-A-Bull members hold education sessions at local libraries, where community members can meet a friendly, CGC certified pit bull. The second Pittie-Palooza event was another success, and we predict it will continue to grow while Save-A-Bull plans for the future. We have already secured additional grant funding from the Animal Farm Foundation to continue offering free training classes. We are now seeking funding to continue our low cost spay/neuter program for pit bulls so that we can reduce the number of dogs entering the humane society’s shelter. The driving force behind Save-A-Bull is the love that the Mohawk Hudson Humane Society’s staff and volunteers have for pit bull type dogs. They are a group of people who live, work, walk and love on these misunderstood dogs every day. By sharing their love of pit bulls with the community, they are making a difference for dogs now and in the future. This story gave me chills, this is the side of “man” I love and the pictures of these adorable dogs are priceless! Thank you so much for featuring us on stubbydog! We love your organization, so it was a huge honor and a very proud moment to see our group’s name on your page! Thank you!! @thhanby And thank YOU for all you do! is there any place that a pitbull can be taken for shelter? I have a friend that is looking for a home for a female pit that is scheduled to be put down this coming week. I live in Atlanta GA and I am desperately trying to find her a home. @MistyJean2203 Carolina Care Bullies in North Carolina may be a resource as well as Villalobos in New Orleans. What a great program. Love to hear that there’s yet another one of these programs being established. Always warms my heart to hear about volunteers dedicated to saving pitbulls. Bravo MHHS!